Today a parcel from the USA arrived. Like Aileen I took part in a swap too, which was swap - bot based. This swap saidf that we are to send something from the stash that will be more usefull for another person. Of course one should ask the partner what his likes/ dislikes and allergies are. I got my parcel from Sandy, who lives in North Carolina. 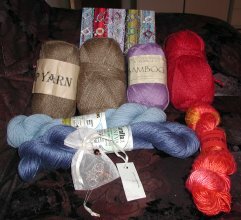 The parcel was full of uncommon fibres, and even though not all of the colours were exactly my taste, I loved it. But hey, I have friends, parents and my boyfriend, right? The parcel contained 6 stitch markers from Meredith by the company "yarn paradise", which were inside a white organza - pouchie. I found a great posctcard with some fibres and some balls and skeins of yarn. The olive green balls (which look grey on my picture, but in reality are light olive green) and the darkred ball have a cool and firm touch. The fibre is hemp, and we don´t really get hemp firbe here. The lightpurple ball is baboo fibre and I already know what I am going to do with it. The darkblue skein is linen, the lightblue skein is pure merino wool and my highlight has the name "koi pond" and is the orange- red skein. That are 50g pure silk. Thank you, thank you, thanks, dear Sandy. You have made me really happy and brought joy to my life with all those great gifts. It is always fun to get goodies in the mail especially those yarn and knitting related! This is a Flickr Module with photos from an album named handmade. Make yourself here your own module.